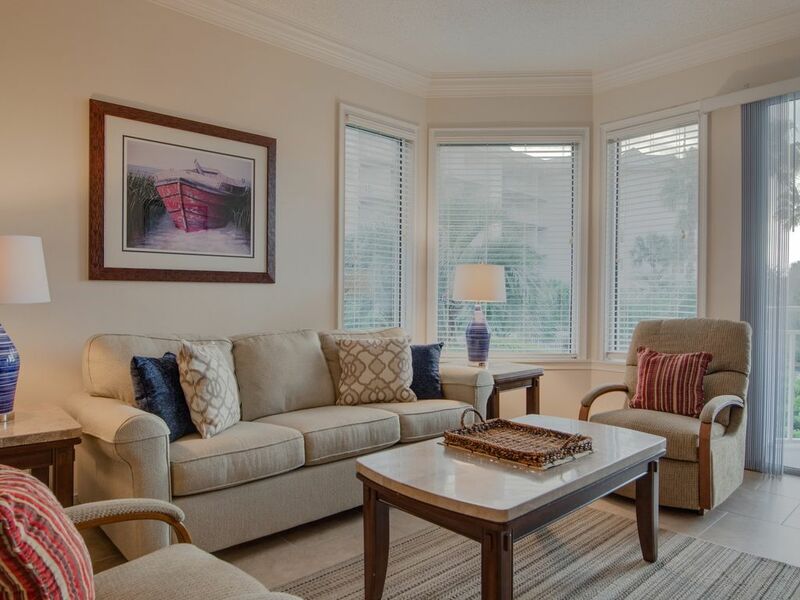 1104 SeaCrest - Belle Villa 2Br, à deux pas de la plage et de Coligny! * Le Sea Crest Resort dispose de 2 piscines en bord de mer, d'une piscine pour enfants, d'un grand bain à remous, d'un centre de remise en forme intérieur, d'une piscine thérapeutique et d'un bain à remous. 1104 Sea Crest est un premier étage, 2 chambres, 2 salle de bain villa. Une vue magnifique sur les jardins luxuriants et l'océan peut être vue depuis les deux balcons situés à côté du salon et de la chambre principale. Nouvelle moquette installée dans les chambres à coucher en avril 2018! Le salon spacieux et confortable dispose d'un 42 "TV à écran plat et d'un canapé-lit avec deux rockers correspondants. La cuisine entièrement équipée, qui a été récemment rénové en 2015. La table à manger adjacente accueillir 6. Hors du foyer vers la gauche est la chambre principale avec un lit King, TV, balcon privé et une salle de bains privée avec une baignoire de jardin, deux lavabos et douche séparée. La chambre d'hôtes est à la droite hors du foyer et dispose de deux lits doubles et partage une salle de bains avec la salle. La salle de bain a une baignoire de jardin, deux lavabos et douche séparée. Vous pourrez profiter de toutes les commodités cette villa a à offrir. Good location, room clean, not as comfortable as hoped. The location on the main floor of the Seacrest is steps from pools, beaches, Coligny plaza, restaurants, etc. It is quite nice. The condo itself was clean and reasonable well equipped. We did not have anything we tried that did not work. With that said, it was not an ideal experience. The beds were either cheap and/or well worn. The King in the master bedroom was particularly troublesome. It sagged in the middle really bad. Hot water also took a very long time to work its way through the pipes. We waited between 4-5 minutes of water running to get hot water to kitchen sink or showers. It did eventually get hot...so it worked...it just wasn't ideal compared to other places we have stayed at the Seacrest. The wifi was good, but the bedroom TVs were the size of computer screens. I think some investments in mattresses, couple of updated TVs and plumbing would make this a more perfect experience. As such, I have given the condo a 4 out of 5. Final note...we didn't have a "bad" experience. We simply didn't have a "stellar" experience either. Hope that helps people considering this room. Condo was nice and well equipped. The condo was nice, beds comfortable and kitchen well equipped. Location was nice. Walkable to Coligny Plaza. Only part that was a bit disappointing was there was construction at the units complex. They were working on the deck by the pool so the couple nice days we had we had to listen to saws and hammers while poolside. Would like to have known ahead of time. Also the unit was a bit difficult to find. There are not signs in the garage saying which building is 1,2 or 3. We did find it but took a bit. Overall would recommend the unit. This property was perfect for our family of 4! We can't wait to come back! This property was fabulous for our family! We have two little boys, 2 and 4. They have lots of energy and I am always worried they will break something! The property was minimally decorated so I didn't have to hide any breakables. There were so many fun places to play hide n seek! The tile floors made it easy to clean. Other units had carpet which would have not worked for us. The location was ideal! Easy to do shopping, grab ice cream, bike ride, do morning runs, the pools and of course the beach! We loved being on the first floor, and far enough away from the door to the stairs and elevator noise. I am glad we stayed in this building and not 2 which seemed to be an echo atrium. Arriving late it was a little disorienting. A better sign or explanation of what building or elevator set we were supposed to go to would have been helpful. Thankfully all of the buildings connected so it was easy to figure out once we parked. We will for sure come back and stay in this unit. I will bring fans (rooms were a bit stuffy) and some better knives for chopping/meal prep. I am glad I brought my own hand soap for the bath and kitchen sinks. I was really impressed with how many linens we were provided! Lastly we rented a crib, bed rails, double stroller, umbrella and bikes from low Sea Rentals and I was so glad how seamless it was! Everything was set up when we arrived. Super convenient! Please call or send email inquiry for stays longer than one week. Online quotes do NOT calculate correctly for longer term rentals or stays that overlap two different rate periods. Monthly rentals are four full weeks, Saturday - Saturday.